Madsyn Davis is hoping to lead Oakleaf High (Fla.) to a repeat 8A title. The 26th Kissimmee Klassic, considered by many as the top high school softball tournament in the nation, kicks off Thursday in Kissimmee, Florida and is so loaded this year that 29 of the 32 participating teams have been nationally ranked this year. One of those is Oakleaf High in Clay County, Florida, which has been ranked as high as #3 in the nation, and is the defending Klassic champ as well as the defending state 8A champion. 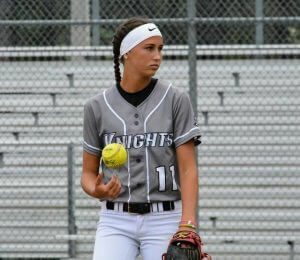 Leading the way for the Knights is 2019 pitcher Madisyn Davis, who over the last two years has gone 34-1 with a collective 0.78 ERA and has been named All-State and been ranked as one of the nation’s top recruits. The 5-foot-9 junior will be one to watch this week and is a success tale on and off the field, but it hasn’t been easy as she committed early and then had to make the difficult decision of telling a university that was decommitting and going to another program. It’s easy to see why any college would want Madysn Davis. Well coached as her father, Addison, has for years led the Jacksonville Storm and sent players to major colleges to Power 5 conferences like the SEC, Madi showed early on that she would be one of the top arms in the 2019 class. 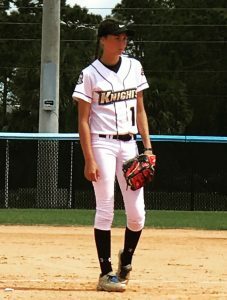 Her ability to throw in the low 60s, change to four different speeds, spin the ball and have pinpoint precise location allowed her to beat some of the nation’s most dominant club teams, high profile names like the So Cal Choppers, Firecrackers, Beverly Bandits, Birmingham Thunderbolts, Georgia Impact, and Tampa Mustangs. Coaches like how she’d eat up innings with the ability to go back-to-back in games and seemingly get stronger the more she pitched. Madi's most effective pitch, she feels, is her change-up. It didn’t hurt either that she is so strong in the classroom that she’s currently taking dual-credit college courses. From Madysn’s point of view, it’s been one particular pitch that has given her the ability to win state titles and earn the opportunity to pitch at the next level. It was no surprise then that the young Florida pitcher was coveted by top teams around the nation and she certainly did her recruiting homework, taking unofficials to college programs around the South like Georgia, Georgia Tech, North Carolina, Central Florida, Troy, South Florida, Georgia Southern, Duke, South Alabama and Florida with opportunities to visit other programs such as Tennessee, Syracuse, Florida State and more. The Florida pitcher committed in the 9th grade but had a change of mind two years later. As has been the case for an increasing number of young, talented softball players, Madi committed early—in the 9th grade (which seems, well, “old” any more)—and she admits that pressure was felt to make a decision when she did. With offers ranging from SEC, ACC, and multiple Sun Belt schools, the Sunshine State hurler thought that Troy University would be good place to compete daily. 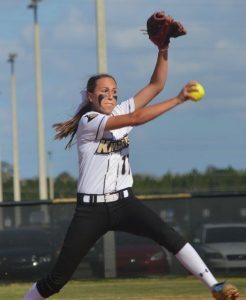 However, after leading Oakleaf High to an 8A state title with a 12-0 record and 0.74 ERA last year and growing even more her sophomore summer playing for her father’s Jacksonville Storm 16U team, Madi’s development took off and she became recognized as a Greg Maddox-style pitcher where her accuracy and control helped her win. Not surprisingly, despite her commitment to Troy, more offers came in during her transition from her sophomore to junior year and, after reflecting on which scenario would be best, Madisyn decided to decomitt from Troy and relaunch her recruiting efforts. It wasn’t an easy decision, nor was the phone call easy when she had to tell the coaches she was going in a different direction. After weighing her options, she found an opportunity that was the perfect fit 2 and ½ hours from home as she fell in love with Central Florida and, ironically, will go from being a high school “Knight” to a college one. Central Florida became the perfect fit in part because it's 2 1/2 hours away. So what advice would she give others going through the process and what would she do the same and differently? As for what helped her, Madsyn said the campus trips were valuable. Having a strong support system was also key she feels. What’s it like having a dad who’s also your club coach? It’s a blessing as God has allowed me to be with my father through hard times and good times. He is hard me on me for sure and sometimes it’s difficult, but my Mom (Natalie) is my balance. Not many people know, but my Mom is a coach as well as she controls the game and calls my pitches with Bryan Jeyvak during all travel ball games. She has been the one since I was 8 years old that has and continues to catch me so both of parents are involved which can be stressful, but I love them and being around them so it all works out. You travel six hours round trip almost every Wednesday to work with pitching coach Jodi Bayles… that’s impressive! How has that helped develop your game? I have to tell you that’s its grind every week, but when you have a coach like Jodi who continues to help me get better on and off the mound, I would drive even further! She knows the game and three years ago was recommended by Coach (Tim) Walton (Univ. of Florida). But she is the best and helps me with my mechanics and always assigns me weekly homework with the focus of getting better. She is calm and focused every week and is a partner in my development. I really care and respect her. What are you most proud of when it comes to Madysn? Natalie and I are most proud of the person Madisyn has become off the field. While she works extremely hard as an athlete, Madisyn understands the core values of integrity, honesty, genuine fellowship, hard work, and self excellence. Her development as a softball player is directly linked to her commitment and hard work when no one is looking! Through her weekly trips to Orlando, weekly workouts with her trainer, and pitching garage work with her mother, Madisyn has grown to compete and we are proud of her accomplishments and inspired by her future on and off the field. What’s she like off the field? Madisyn is a really cool kid and enjoys fellowship with everyone. She always carries herself with a smile and constantly leads respect and care for others. Madisyn is an unselfish kid that brings laughter to all and is extremely fun to be around. One of her greatest strengths is her belief and commitment to her faith as God continues to be a driver of her life! Any dirt you can dish on Madi? Madisyn spends the bulk of her time with her best friend, Baylee Goddard (Florida commit). They have been best friends for 10 years since Baylee’s father passed away. To date, the only problem that I have with Madisyn is that she honesty believes she is a DI basketball player and I cannot keep her off the courts! While she is 5-foot-9 and can shoot, her bread and butter is spinning it in the circle.